Working on A* to navigate the waypoints. Then on summarizing it here. I’ve rehauled the entire waypoint system to allow more intellegent navigation of an indoor environment. The waypoint system I had before simply said ‘if you can’t find the player, just loop around these waypoints until you do”. That’s alright when the AI has a large field of vision, or is near the player, but in an indoor environment with multiple paths and many barriers, that just doesn’t cut it. 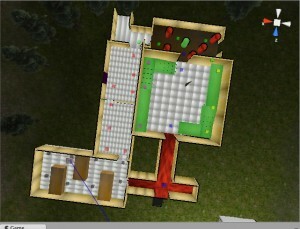 What you see here is a small section of the level I’m using to test navigation. The textures are slightly random and all very free. Hence the goofy fluorescence. Scattered throughout the level are waypoints. They show up in the editor as cubes of various colors, but they are invisible in the actual game. Waypoints are grouped into ‘paths,’ marked by color. Each waypoint stores information about itself, such as what path it is in, its position in that path, and what paths are connected to that waypoint. Waypoints are split into paths for several reasons. The prime reason is that it allows the AI to reach a specific destination much more quickly. If the AI is alerted to the player’s presence by an alarm (something which, in this system, would be extremely easy to implement), the AI can figure out how to get to the player from even a great distance away. It simply checks what path the player is on, then, if the AI is not on that path, can check the nearest connected path, until it figures out a route and begins traveling it. It’s not quite working yet. I’m having some problems keeping the AI from getting confused if it sees the player, chases him, and then loses sight. It should just grab the nearest waypoint that leads to where it lost sight of the player, and travel along that path, but oftentimes it grabs an impractical waypoint as its target (at one point I was crashing the game with a possibly infinite loop. Oops). Other minor tweaks abound, too, including tighter movement for the enemy more suited to indoor environments. Never hurts to give this a mention, but I’d just like to note that all code on this blog, unless noted otherwise, is by Nathan Whitehouse. Just send a heads up if you’re going to use anything posted here. I’d mentioned some problems getting the AI to not see through walls. They didn’t look like hard problems, but they took forever to fix. Look for an update to this post with some more depth on what had to happen, but for right now, back to scheme…. The door and control panel are both modeled by me; I’ve been putting together a complete asset list and trying to get those out of the way early. I’m not spending much time on detail. 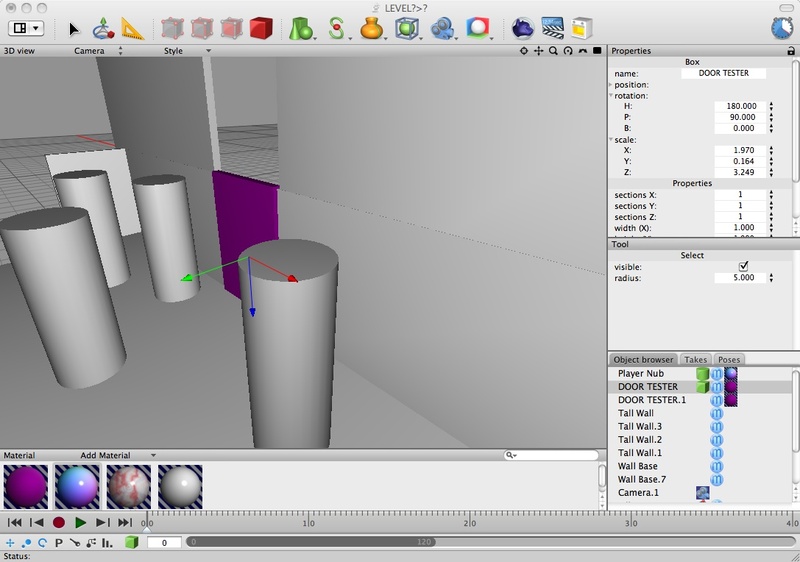 The control panel object you see can be linked to a door, and interacting with it using an ‘interact’ key causes the door to either open or close. I’ve been having extreme problems with making the AI not be able to see through walls. I thought I had it down, but then AI weirdness, like suddenly standing still and inching away slowly from the player, or rocking back and forth, started showing up, and since then it’s been nothing but a headache. The idea was to cast a line between the enemy and the player. If a collider was detected in between them, then the AI would not see the player even if they were in the AI’s theoretical field of vision. I am not completely sure what is going on, and I’ve tried many methods of this implementation, and done things like cast the ray (or line) from an empty game object above the enemy’s head so that terrain wasn’t getting in the way (he’s a stubby little guy). I’ve let this slow me down for a while, though, so now I’m trying to sort of play catch up on the non-AI design work I have to do. In my original plan, assets and gameplay specifics were supposed to come later. To some degree they still are; I won’t be able to know what the AI can do in the end until I try to make it do it. But right now I’m trying to get all the pieces I can done. Are working. 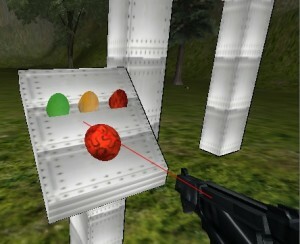 All objects tagged “Waypoint” are dynamically added to an array of waypoints. When the AI opponent comes within a set distance of the target waypoint, that waypoint is moved to the back of the array, and the new top waypoint becomes the target destination. Of course, if the player gets near, the AI abandons the waypoints and chases the player until he manages to escape, in which case it’s back to the waypoints. FindNextWaypoint is called when the player leaves the AI’s hearing radius. A logical next step would be to make the AI start with the nearest waypoint when the player eludes it, rather than the last waypoint it was on in the series. As of last night, those who boot up the game will find themselves being doggedly perused by a tiny, speedy little box and a lethargic floating capsule. Progress! The two opponents are able to find the player, orient themselves towards him or her, and move towards them. Movement took a bit of doing, in part because of quaternions being the default form in which object rotations are stored. Thankfully, after much time spent trying to manipulate the quaternions themselves, I found that Unity has some handy functions for those who don’t want to dip into the complex plane. Such as Quaternion.LookAt, which allows easy focusing of an object’s attentions. The movement portion works, but I’m not sure I completely understand it. For example, the capsule-shaped enemy is set to ignore gravity, causing it to lazily float towards its target (It could quickly float, if I changed the public variable “speed” in the inspector). Because it has a collide, however, if the player jumps on top of it, he can cause it to become ‘destabilized’ and spin about for a moment. 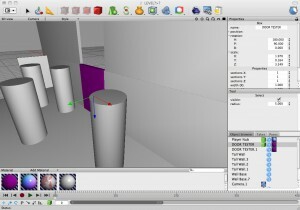 Once the capsule has been destabilized, it will usually orient itself right side up again, but will no longer chase the player. Instead, it simply begins to drift towards the heavens, wobbling ever so slightly, until out of sight or shot down mercifully by the player. I don’t know why this happens. It could be the way I’m moving objects isn’t completely right, or it could simply be that physics objects with no gravity act really strangely (so far the cube is well behaved). 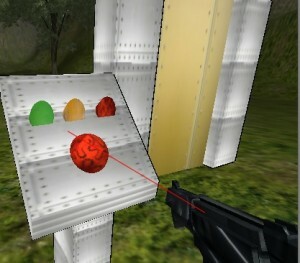 I’ve given the enemies a ‘hearing range’ – the player’s presence in a certain radius allows the enemies to chase him. Otherwise they simply wait and listen. Very crude, but it’s a start. I’m working on waypoints – if the enemies don’t know where the player is, they should go to places he might be, or patrol. Also, the enemies should have a vision range in front of them larger than their listening range, should chase a little bit after they can no longer detect the player, and ideally a motionless player will not cause any ‘noise’ for the enemies to hear. There are also assorted touch ups, including better aiming, easier to edit variables in most functions, and some nice new trees that really ‘spruce’ up the level. …make me wish I knew more math.